A highly engaged shopping community, with 90% of sales coming from repeat/reactivated customers. Exceptional selections in health & beauty, jewelry, home & lifestyle, fashion & accessories, and electronics. Engaging via stories, personalities, and service, with a passionate, value-driven team. The original TV shopping company, transformed. HSN is a leading entertainment and lifestyle retailer, with a curated assortment of exclusive products and top brand names. We incorporate entertainment, inspiration, personalities and industry experts to provide an entirely unique shopping experience. HSN is a leading entertainment and lifestyle retailer, with a curated assortment of exclusive products and top brand names. 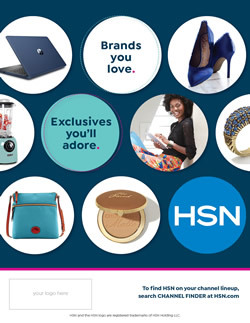 To receive a specific HSN logo, please contact your QRGN representative. HSN is a leading entertainment and lifestyle retailer, with a curated assortment of exclusive products and top brand names. We incorporate entertainment, inspiration, personalities and industry experts to provide an entirely unique shopping experience. Find HSN on channel ___. Be sure to customize the tune in with the HSN channel number in your lineup. Questions about HSN? Please contact your Qurate Retail Group Networks representative for more information.